I am currently a software development manager in AWS Database Services, in Palo Alto, CA. In my spare time, I audit the world's best sorting algorithms and platforms as a member of the Sort Benchmark committee. I have a personal blog where I post random musings on technology and life. I also have a family blog where I write about recent events in my family. Mehul is currently a software development manager working on AWS Redshift where he has helped deliver two key features: interleaved sort keys and UDFs. Prior to that, he was co-founder and CEO of Amiato (2011-2014), a managed ETL service in the cloud. From 2004-2011, he was a principal scientist at HP Labs where his work spanned large-scale data management, distributed systems, and energy-efficient computing. 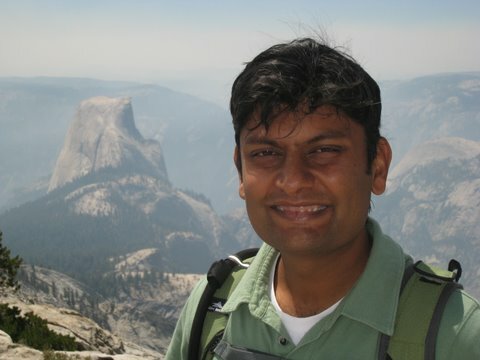 His work has been published in top-tier database and systems conferences, and he has received one best paper award. At HP, he helped build Sinfonia, a scalable, distributed transactional system, and HP KVS, a geographically distributed large-object store. Prior to HP, he received his PhD from U.C. Berkeley (2004) for adding parallelism, fault-tolerance, and load-balancing to the TelegraphCQ data-stream processing system. In 1999, he worked on the IBM DB2/UDB database. He received his MEng (1997), and BS in CS and Physics (1996) from MIT. In his spare time, he serves on the Sort Benchmark committee. This list is out of date. Please see my DBLP entry for a complete list of my publications. Analyzing consistency properties for fun and profit. Wojciech M. Golab, Xiaozhou Li, Mehul A. Shah. Eric Anderson, Xiaozhou Li, Mehul A. Shah, Joseph Tucek, and Jay J. Wylie. Eric Anderson, Xiaozhou Li, Arif Merchant, Mehul A. Shah, Kevin Smathers, Joseph Tucek, Mustafa Uysal, Jay J. Wylie. Dimitris Tsirogiannis, Stavros Harizopoulos, Mehul A. Shah. ACM Trans. Comput. Syst. 27(3): 2009. Tracking the Power in an Enterprise Decision Support System. Justin Meza, Mehul A. Shah, Parthasarathy Ranganathan, Mike Fitzner, and Judson Veazey. International Symposium on Low Power Electronics and Design (ISLPED), August 2009. This is not available elsewhere on the ISLPED site, so feel free to link here. Query Processing Techniques for Solid State Drives. Dimitris Tsirogiannis, Stavros Harizopoulos, Mehul A. Shah, Janet L. Wiener, and Goetz Graefe. Jeffrey C. Mogul, Eduardo Argollo, Mehul A. Shah, Paolo Faraboschi. Stavros Harizopoulos, Mehul A. Shah, Justin Meza, Parthasarathy Ranganathan. Conference on Innovative Data Systems Research (CIDR), January 2009. A Pratical Scalable Distributed B-Tree. Marcos K. Aguilera, Wojciech Golab, and Mehul A. Shah. International Conference on Very Large Data Bases (VLDB), August 2008. Marcos K. Aguilera, Arif Merchant, Mehul A. Shah, Alistair Veitch, and Christos Karamanolis. ACM Symposium on Operating Systems Principles (SOSP), October 2007. Best paper. JouleSort: A Balanced Energy-Efficiency Benchmark. Suzanne Rivoire, Mehul A. Shah, Parthasarathy Ranganathan, and Christos Kozyrakis. Mehul A. Shah, Mary Baker, Jeffrey C. Mogul, and Ram Swaminathan. Patrick Reynolds Charles Killian, Janet L. Wiener, Jeffrey C. Mogul, Mehul A. Shah, and Amin Vahdat. Symp. on Networked Systems Design and Implementation (NSDI), , May 2006. Mary Baker, Mehul A. Shah, David S. H. Rosenthal, Mema Roussopoulos, Petros Maniatis, TJ Giuli, and Prashanth Bungale. IT Infrastructure in Emerging Markets: Arguing for an End-to-End Perspective. IEEE Pervasive Computing, April-June 2006. TelegraphCQ: An Architectural Status Report, IEEE Data Engineering Bulletin, March 2003. Wei Hong, Sailesh Krishnamurthy, Samuel R. Madden, Vijayshankar Raman, Fred Reiss, and Mehul A. Shah. Continuously Adaptive Continuous Queries over Streams, SIGMOD Conference, 2002. Henry Kautz, Bart Selman, and Mehul Shah. ReferralWeb: Combining Social Networks and Collaborative Filtering. CACM 40(3): 63-65 (1997). The Hidden Web. AI Magazine 18(2): 27-36 (1997). This was the first work that presented techniques for automatically extracting social networks from the web. Although I am the sole author (as required for all theses), this work was done jointly with Henry Kautz and Bart Selman while I was at AT&T Bell Labs. My thesis advisor (and collaborator) at MIT was David Karger .